Every woman has her own story to tell. This is Jennylyn Mercado's story. Max Factor recently launched Jennylyn Mercado as their first Filipina endorser. Jennylyn an image of today's empowered Filipina headlines Max Factor's #YouXMaxFactor #BeautyWithDepth campaign which aims to redefine beauty from inside out. Ultimate Star Jennylyn Mercado bags the 'Best Actress' award at the 8th OFW Gawad Parangal for her role as 'Charity Salvador' in the recently concluded Telebabad series 'The Cure'. The awarding ceremony will be held at Selah Pods Hotel, Pasay City this December 9, 2018. LOOK: Who will be Jennylyn Mercado's next leading man? The Ultimate Star is gearing up for her next prime time series and many are curious on who will her next leading man be. Rumors are starting to circulate and two names have popped up. First is Derek Ramsay whom Jennylyn had the chance to work with in the past in two romantic comedy flicks 'English Only, Please' and 'All Of You'. The other, award winning actor Gabby Concepcion. If this pushes through, this will mark the first time Jennylyn will get to team up with Gabby. What do you think Kapuso? 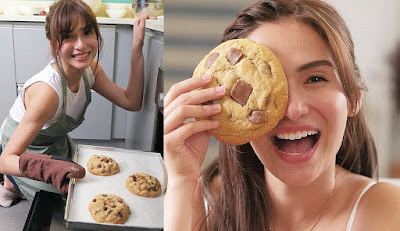 LOOK: Jennylyn Mercado's 'Chunky Dough': From hobby to online business! What's baking for the Ultimate Star? Jennylyn Mercado is all set to launch her online business 'Chunky Dough'. 'Chunky Dough' offers home-made cookies baked by Jennylyn herself. What started as a hobby is now an online business for the Ultimate Star! Are you ready for a doughlicious cookie experience?